The materials that make up a Prodigy instrument fall into two categories. • The hardware and fittings. 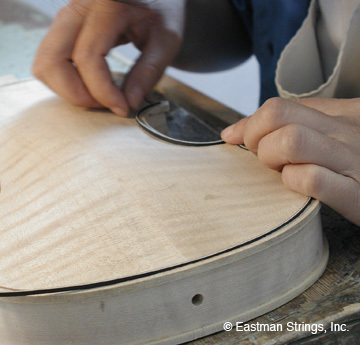 In order to create world-class string instruments, you have to begin with the finest tonewood. And for this, we travel all the way to the Far East. Prodigy string instruments are hand crafted using tonewood indigenous to China, which is one reason why making string instruments in Asia is naturally cost effective. All wood is not created equal. There are some that are naturally ideal for creating beautiful sounds. In the world of violin-making, these particular fine woods are called tonewood. They are used to make the body of your Prodigy instrument, the top, back and side, encouraging naturally rich, powerful tones. For the top of the instrument, a soft wood is preferred. And for the finest string instruments, including Prodigy, spruce is the first choice. We choose spruce that has a straight, even grain. When it’s carved to the perfect shape and thickness, spruce becomes highly resonant. This is the start to a beautiful sounding instrument. The back of your Prodigy instrument is made of a hardwood, maple. There are two reasons for this. One, hardwood has great inherent strength, which makes it ideal for the back, ribs, neck and scroll. Most importantly with the back, hard maple is very reflective to sound. This lends more power to your performances, projecting your music to farthest reaches of the concert hall. Since the wood used to make a Prodigy instrument will have a great impact on the sound of the instrument, our luthiers go to considerable trouble to start every instrument by hand selecting seasoned tonewoods. Visit our workshops and learn more about the wood used to make our high quality string instruments . The other woods used for making string instruments are nearly as important as the tonewood. These are the woods chosen to become the instrument’s fittings and hardware. The woods that will be carved into fingerboards, pegs, tailpieces, endpins and chinrests come from a category known as tropical or exotic hardwoods. This includes ebony, boxwood, rosewood and a few others. Fingerboards and other fittings require an extra-hard wood for strength and durability. Ebony is the wood most commonly used for string instrument fittings. It has been a popular choice for hundreds of years not only for its extreme density and hardness, but also for its uniform dark black color. It is quite common for student string instruments today to use imitation ebony, or “ebonized” woods, made by coating softer wood with a black stain or a hard black resin. Prodigy, of course, doesn’t believe in this practice. Therefore our string instruments use only genuine solid ebony fittings. Boxwood is also a very hard wood, and is often used to make the hardware of Prodigy string instruments. Boxwood has a uniform light-brown color with faint grain lines, which makes it very attractive. Boxwood can be stained and often has a beautiful flame. Many Prodigy instruments have beautiful boxwood tuning pegs and other fittings. This is more typical of a higher end instrument. All this attention to detail brings a tonal quality that is often considered quite superior to many other student models. Learn more about how our carefully chosen tonewood creates a sophisticated look and sound. 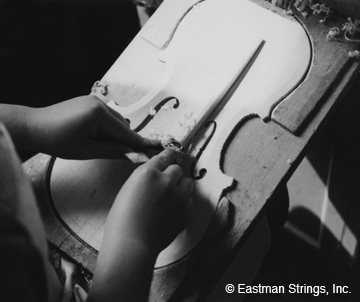 Meet the craftspeople who make building fine string instruments their life’s work. Find out how Asian string instruments are equal to, or superior to European string instruments.